excuse not to clean house. Great Auntie Fern would have been 110 today. There were times that I thought Auntie Fern might outlive all of us, and then halfway into her 108th year she was gone. I miss her. We all do. I got involved with all of her medical care, sort of by accident or maybe by providence, when she was 99. (My husband is related by way of his late "Gram", who was Fern's older sister.) 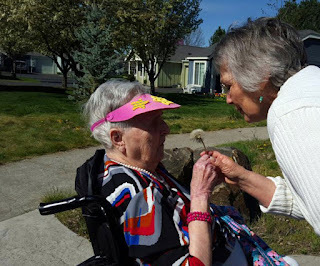 We would stop at the retirement home to visit, and sometimes have dinner with her. She loved company. That's how the home happened to call us one day to say that Fern had been ill. This presented a problem for the staff because after a certain number of days a resident would have to move to a higher care facility. I offered to take her to the clinic and get some help for her. When the doctor walked into the examination room he took one look at me and asked, "Are you just here today, or are you committed to the long haul?" I took two spills in the snow which was deep and long lasting. Over a month!. The first tumble was when I fell in the deep snow wearing my husband boots. I was out there before dawn to scatter shredded apple in the back yard for the over one hundred hungry robins that were showing up with the sun. Plus quite a few other birds as well. The 2nd time was a foot slipping out from beneath me while making a short trip across the asphalt. That one hurt .. and twisted my ankle. The x-rays at the walk in clinic (joke, as I didn't really walk in) showed that all the hardware from a previous break was intact and no broken bones. Just a sprain which kept me off my feet for a week. But now I'm kickin' dirt. The snow is gone everywhere except in shady areas behind fences and houses and where the trees cover the walking path. The sound of our patio collapsing under the ice at 2:30 in the morning was enough to age me five years. I won't prove it by posting a photo of me. And, DARN. That Insurance deductible already had a home somewhere else. I'm ready for winter to end. I've learned much about the robins and winter residents this month. 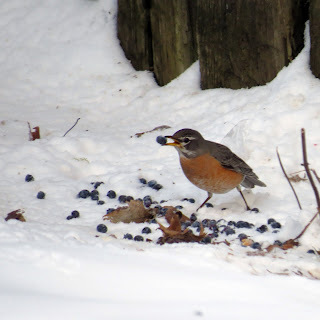 The first thing is that if you give robins blueberries you might as well go buy a bunch more of frozen ones. Once they've had frozen blueberries they give you the bird eye until you give them more. I do provide many choices: chopped apple, oatmeal, sunflower chips, raisins, grapes, mealy worms. They eat them all. But don't ever start with blueberries. Robins also get very domineering and territorial. One will decide that the feeding area is his or hers alone. It becomes a chase and fight zone. So be prepared to shovel snow and create various spots in the yard so that more robins can become land owners. I should never gloat. Not that I was gloating. But I did say that our moderate weather had been a blessing. Then we got blasted, of course. The weatherman said today we were on our way to the third coldest February on record. It isn't all bad, though. Did you read that the cold weather will most likely kill off lots of the invasive stink bugs. The ones hiding in the garage and storage addition will most likely survive. We certainly hope to see less of them this summer. The birds have been very hungry which gives me an opportunity to invite them into our yard with fruit, nuts, seeds, mealy worms, and water. There is heater in the water feature so it supports a lot of winter drinks. Some even bathe in the freezing weather. 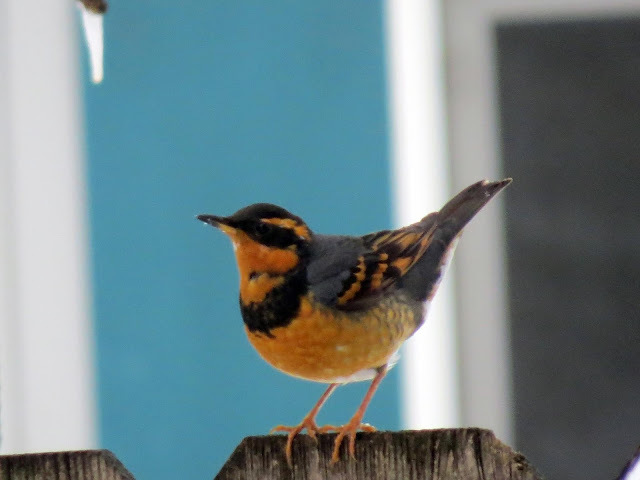 One of the birds that I only see during periods of snow and low temperatures is the lovely Varied Thrush. We have been listening to their mournful sounding call every day with appreciation. They must be singing their thank you for the hospitality. We've been on a kick lately. Tapioca Pudding. I made it twice in the microwave, but couldn't get it to turn out the same each time. So then I switched to the old bring to a rolling boil method. Which has worked. However, my recipe seems not quite as sweet as what you buy in the dairy section at the grocery store. Not to mention that I have twice forgotten to add vanilla. I made pudding today with added sugar and REMEMBERED the vanilla. Real vanilla. During my childhood it was such a treat to have tapioca pudding. We had a small farm so the major ingredients were there at hand. Mom ALWAYS used the method where she beat the egg whites separately and then added it before serving to make a fluffy dessert. There were so many of us that she probably made a triple batch. I don't remember ever getting my fill. Always left wanting more. I am a grandmother, a wife, a mother, a sister, and a friend. I know that a woman who will tell her age or her weight will tell anything. I won't tell mine, so you can trust me. I have a cat. I have a duster that I don't use. The photo header is one I have taken of Gram's antique writing desk. My dust.